Property Description: 2 stories; symmetrical façade dominated by full- height porch; porch composed of Doric columns, classical pediment, and gabled roof; recessed porch above main entry with ironwork balustrade; moderate boxed eaves under main roof; wide frieze band underneath cornice line; doorway surrounded by rectangular transom and sidelights. Window Condition: Appear to be original. 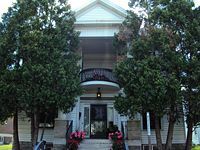 1815 Bryant Avenue North proudly houses INSIGHT NEWS. History (taken from: http://insightnews.com/about-us): "Insight News started in 1974 as a color-cover magazine based in and serving Minneapolis' African American north side. It was owned by Graphic Services, Inc., a general printing and magazine publishing firm in Northeast Minneapolis. Al McFarlane, headed the Midwest Public Relations division of Graphic Services. In 1997 Insight News once again distinguished itself from its competitors by initiating a series of public policy forums. In partnership with community radio station KMOJ, Insight has brought the people who would serve the community in elected office, in education and in business to meet African American voters and consumers face to face." This page was last modified on October 5, 2010, at 22:39.